“Well over 100 interviews in the past 30 years serve as testimony to Mr. Moore’s willingness to be engaged in productive conversation. 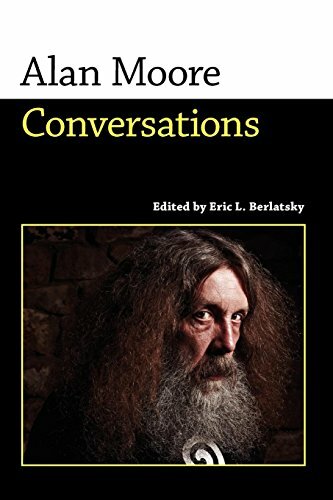 Alan Moore: Conversations includes 10 substantial interviews, beginning with Mr. Moore’s first published conversation, conducted by V for Vendetta cocreator David Lloyd in 1981. The remainder cover nearly all of his major works, including Watchmen, V for Vendetta, Swamp Thing, Marvelman, The League of Extraordinary Gentlemen, Promethea, From Hell, Lost Girls, and the unfinished Big Numbers. But it is the work of Alan Moore and how he came to create such riveting characters and series such as V for Vendetta and The Watchmen that this collection of interviews is really about. Mr. Moore is credited with playing a “significant role” in the cultural transformation of the comic. What were once regarded as the territory of kids and adolescents are now prized both aesthetically and commercially, not least by Hollywood. But the changes attributed to Mr. Moore go deeper than this. While he describes how he aims to evoke a mood or atmosphere with the words he provides the artist to work with, he is also seen as being responsible for changing the perception of just who it is that provides the creativity in comics. Alan Moore has prompted thinking to move away from the person who draws the pictures and toward the person who draws pictures with words. It is because of this that this collection of interviews will appeal not only to fans of his work, but also more widely to the many writers of fiction seeking to hone their craft. A good example of this is in an interview in which Mr Moore produces a riveting answer when asked to explain his method of producing a comic story. The reader is treated to his thought process, which is far less idiosyncratic than one might expect. In effect, he does what every fiction writer does—or should—do, and that is to create a “world” that his characters live in. From election results, to freak weather conditions, a world is evolved in tremendous detail; and while he admits this information is unlikely to appear in the strip, it most definitely determines what happens in it.